Villagers in Tawal area see their first Dentist ever! 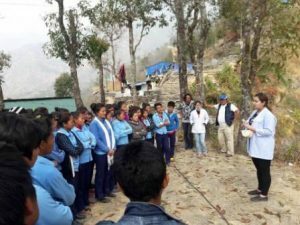 Five female Nepali dentists from Kathmandu-based Kantipur Dental College Teaching Hospital and Research Centre, led by Dr Smita Dhakal, Dental Surgeon, conducted the first ever dental camp in Ri VDC, Dhading district from 24-27 February 2017. NAFA’s Rod and Deborah Setterlund welcomed the dental team to the village of Tawal, which hosted the four day camp. 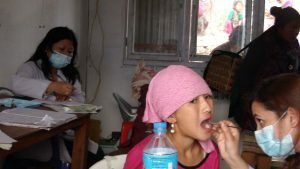 The camp was funded through an earmarked donation from a NAFA supporter, though the dental hospital only sought reimbursement of out-of-pocket expenses, with the salaries of the dentist covered by the hospital. Notices had been displayed in the 25 villages that make up the Ri VDC informing them of the free camp that is hoped to be the first of a multi-year needs assessment, screening, treatment and community education program. A total of 208 patients (143 female and 65 male) attended the camp, with most having oral health problems. In fact, only 5 out of the 208 were assessed as having good oral hygiene. The main problem dentists identified is irregular brushing of teeth. Therefore the educational focus was on demonstrating the importance of twice daily brushing and rinsing the mouth with water after eating sweets. 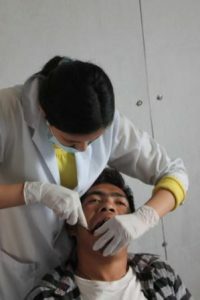 Over the four days, the dentists performed 36 teeth extractions and 4 fillings.